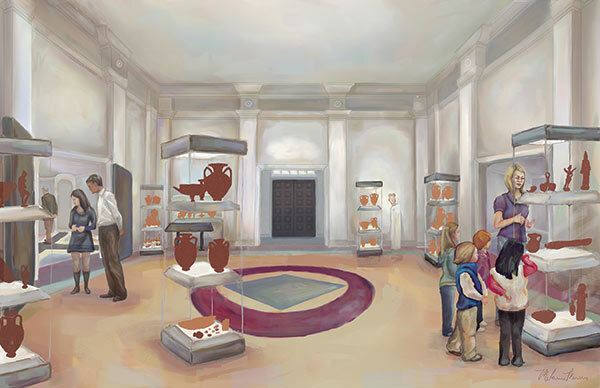 In spring 2013, the Museum began the development of a major project that will introduce a state of the art redesign and reinstallation of its Greek and Roman Antiquities Collection. The project team includes both Museum staff and Classics Department faculty. Additionally, the Museum has also engaged a national design consultant, Alchemy Studio, and Project Manager Melanie Munns. The collection will be installed in the four neoclassical gallery spaces of the Museum’s original 1939 building. This larger space will allow the Museum to triple the volume of objects on view. Currently the collection numbers over 2,000 objects with only 137 objects on display. The expanded exhibition will include touch-friendly technology for children and adults (a first in our museum’s history), new display casework, enhanced on-site study access for students, faculty and the general public, and improved gallery security. The Museum will also initiate a digitization project to increase internet-based access to the Collection. Educational impacts and benefits to youth and families of the region, to university students and faculty, and the Museum’s diverse public audiences cannot be overstated. The Museum is currently developing resources and identifying funding partners to undertake this world-class reinstallation that will further enhance the name of the University of Mississippi Museum among the great national repositories of collections from classical antiquity.